The city of Los Angeles should begin repairing tree-root-damaged sidewalks by late 2016. Photo by Joe Linton/Streetsblog L.A.
At a joint meeting yesterday, the L.A. City Council’s public works and budget committees approved the outlines of how Los Angeles will spend $1.4 billion to repair its damaged sidewalks. The sidewalk repair funding is due to the city settling Willits v. City of Los Angeles, a class action lawsuit over L.A.’s failure to make the public pedestrian right-of-way accessible to disabled people. The $1.4 billion will be spent over ten years. The plan still needs the approval of the full city council, but with nine of fifteen councilmembers on committees already approving, that should be a formality. The plan approved yesterday is essentially the “fix-and-release” plan proposed in 2015, with a series of 23 amendments outlined in a February 2016 letter [PDF] by councilmembers Paul Krekorian, Joe Buscaino, Mike Bonin, and Nury Martinez. The Los Angeles Times and NBC4 reported on the specifics of yesterday’s approval. Though a lot of the fine grain details are yet to be worked out, there is a lot to like about the newly approved sidewalk repair plan. But there are also some worrisome aspects to it. Something will get done. According to Budget chairperson Paul Krekorian, approving this plan now puts the city on track for Fiscal Year 2016-2017 expenditures, which starts in July. The settlement commits the city to $31 million in sidewalk repairs for each of the first five years of the ten-year program. If all goes well, the city could start spending money to fix sidewalks before the end of this calendar year. With work getting underway, and progress open to public and legal scrutiny, there will be continued opportunities to shape the program. The committee’s amendments – incorporating issues from tree canopy to rainwater runoff to Vision Zero – bring attention to numerous related issues that should be addressed during sidewalk repair. The devil could be in the details. Numerous amendments direct city staff to finalize prioritization scheduling, scheduling, enforcement, legal, etc. With so many parameters still to be worked out, the overall shape of the massive public works program is not yet entirely clear. The fix-and-release approach is unproven and contains some flaws. It may be the best approach available right now, but it seems unlikely that drivers or railroads or flood protection or communications networks would ever settle for a similar patchwork model. Overall, the program will prioritize repairs in front of single-family residential properties. There are perverse incentives that reward some tree removal – though councilmembers and city department heads expressed support for preserving trees where feasible. Sidewalks excluded from the program include those in front of schools and other non-L.A.-City governmental sites. Pedestrian advocates had pressed for an inventory to allow the city to come up with a strategic plan for sidewalk repair. The city is developing a tracking system that will show what has been requested, scheduled, and completed, but, at least at the outset, there is no full-on strategic inventory. Prioritization could be a political mishmash. There will be a data-driven scoring system, but that is one of the details still to be worked out. In theory, the city will be addressing “the worst of the worst” first, plus using a “complaint-driven system” responding to requests from people with disabilities. Councilmembers requested that they play a role in prioritizing work, too. Like many progressive L.A. city plans, the initial approval may be less contentious than the implementation still to come. Why are sidewalks in front of schools and non-LA city government sites excluded? Should these sidewalks be covered by some other program? Sites controlled by LAUSD and other non-city governments are and always have been responsible for the upkeep of adjacent sidewalks. They are obligated now and in the future to repair them if they are damaged or in any way a barrier to mobility. If these entities do not repair what’s required, they will be cited and potentially fined. In theory, the school district needs to repair their own sidewalks… in practice, disability advocates may need to sue them to make it happen. The easiest ones to repair should be the ones with a parking space in front of them. Just eliminate the parking space and put in ramps and bollards so pedestrians can go around the tree. The idea of having trees on sides is stupid anyway. They should be in the street. It’s a shame the settlement really only focuses on the lower-volume sidewalks. For the most part, the sidewalks that see the most use are in Downtown and the denser neighborhoods of the city, not in front of single-family residences. Of course, fixing all sidewalks is important, but I wish those negotiating the settlement would have considered a more fair scope of work. Oh come on. Just make the sidewalks a city responsibility and fund them out of the “road tax”. They’re part of the road. Today, the Los Angeles City Council approved the final touches to get its $1.4 billion sidewalk repair program going. 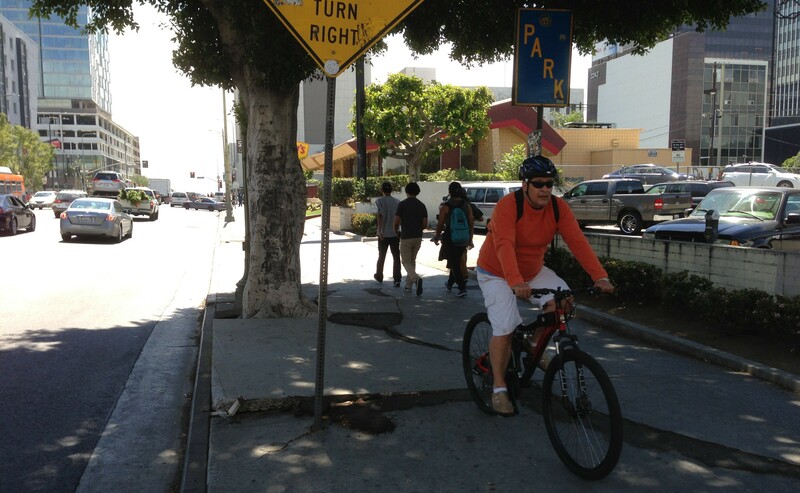 The city sidewalk repair program will go by the name Safe Sidewalks L.A.